Early-day Texans and Comanches were not always trying to kill each other, it just seemed like it. The Republic of Texas, and later the U.S. government, did execute a few peace treaties with the Indians, but the problem was more complicated than something a mere signature could fix. A well-meaning chief might agree to lasting peace, but in a culture built largely on raiding, bravery in battle and the number of horses a man owned, not every ambitious young man in his tribe was likely to go along with a written agreement of non-hostility. And not every Comanche headman, either. One Comanche who did put his sign on a piece of paper and lived up to it was a Penateka chief named Katemoczy, who often camped along the San Saba River in the northwest corner of what would become Mason County. German immigrant John Meusebach worked out that treaty with the Comanches in 1846 and it held. Because of that document, German settlers in the Hill Country, while not immune from Indian depredations, fared better than many other frontier Texans. 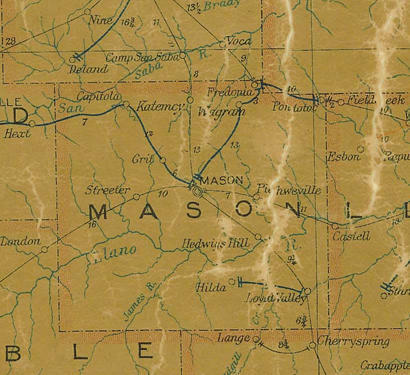 As Mason County began to settle up, some held the chief in high-enough esteem to name one of their towns in his honor, though it was an afterthought. When settler Andrew Jackson Coots built a cabin in the area in the latter 1870s, people started calling the community that developed around Cootsville. Dr. William F. Cowan and his wife moved to the area in 1879. Whether it was the doctor�s idea or one of his two sons, the place came to be called Katemcy in misspelled honor of Chief Katemoczy. One of the doctor�s sons, Alfred R. Cowan, donated land for the Katemcy town site around 1880. Four years later, he became Katemcy�s first post master. One of seventeen post office towns in Mason County, Katemcy flourished until the mid-1920s. In its peak years, it had two drug stores, two general stores, two blacksmith shops, a barber shop, a business described as a �chili shack,� three churches and a school with three teachers. Half of the letter was taken up with a plea for improved transportation. For a time, the forerunner of Highway 87 from San Antonio to San Angelo passed through Katemcy, bringing with it just enough out-of-town business to keep the economy alive. But when state engineers relocated the highway about a mile to the west, the impact on Katemcy proved severe and the town began a slow decline to just shy of ghost-town status. One thing that has lasted, however, is a historical marker put up in 1967 at the site of what for years had been the smallest piece of state-owned land in Texas. Intended for use as a mini-state park, the tract eventually went back to private ownership. Katemcy, meanwhile, has been virtually forgotten along with an Indian chief who preferred peace to war.